The absolute best thing about my recent blogging endeavors – other than baking delicious things on a regular basis and then getting even more personal with them by photographing and writing about them – is online community sites like FoodBuzz that connect bakers and bloggers with fabulous causes and the companies that fund them. This recipe was inspired by Kelly’s Tea Party for a Cause. “Electrolux and Kelly Ripa are proud to support the Ovarian Cancer Research Fund whose mission is to fund research to find a method of early detection and ultimately a cure for Ovarian Cancer. Electrolux has committed to donate $750,000 to this worthy cause.” (From Kelly Confidential website). I am a featured publisher on FoodBuzz, and for every Tea-Party recipe created by a featured publisher, FoodBuzz will donate $50 to the Ovarian Cancer Research Fund! Thank you, FoodBuzz! This recipe/post will also be eligible for FoodBuzz Top 9 Tea Party Takeover on Friday, March 25th, where 9 of the most delicious posts will be feature on the site. Please go to Kelly Confidential, and take one minute to select your dresses and tea set for an online tea party! Every time you do so, Electolux will donate $1 to the cause. This is a great thing to do with a little lady in your life! I’ve had a blast playing with recipes for this event, and when my fifth batch of French Macarons came together last night, I knew I wanted this to be my submission. Laced with subtle lavender and tart lemon, these are the perfect little delicate treats to balance on dainty fingers and follow with a cup of tea. And they’re naturally gluten-free and dairy free (depending on the filling), so they’re a treat for those of us with food intolerance. Now macarons are tricky. This was my fifth and most successful try. Check out my blog posts on A Cup of Macaron and French Macarons Take One for tips on what did not work and what improved dramatically. What I’ll stress here is to let your egg-whites sit for at least 24 hours, covered with a paper towel, at room temperature. This will help some of the water evaporate and the protein build. Also, when whipping egg whites, start on low and increase the speed, and do not overwhip. You want stiff peaks but a glossy batter. Filling: I used a pre-made lemon curd from Ina Garten, but I suggest using her recipe if you have the extra time. It’s spot on. And I love her. Pulse the almond flour and powdered sugar until blended, then sift twice to make sure all larger pieces of almond are separated out and the flour is blended well. Add the lemon zest and lavender to the flour and set aside. Pulse the white sugar in processor until very fine. In the large bowl of a standing mixer or by hand, start whipping egg whites until foamy. Add a pinch of cream of tartar, and whip until soft peaks form. Reduce speed to low, and add the fine white sugar one tablespoon at a time. When fully incorporated, increase speed to medium and then to high, and whip until stiff-peaked. Timing varies on this, and this is where practice makes perfect. Add your food coloring gel when almost completely done whipping. Sift 1/3 of the flour into the egg and fold in completely. Repeat until all the flour is incorporated. You want to fold in until the batter is smooth, but still light. Spoon into pastry bag fitted with a large tip (I use between 1/2 and 1 inch, depending on what I grab first). Pipe 1 inch rounds onto parchment lined baking sheets, pulling the tip to the side so as to not leave a peak mark. I use very thick sheets for this recipe. Double up if needed. Tap the pan somewhat assertively on the counter to remove any trapped air and help batter to settle. Let sit for 1/2 – 2 hours, until a shell forms on the top and your finger pressed lightly doesn’t leave a mark. Now, bakers are completely split on the right temperature for baking macarons. Some bake slowly and cooly at 270-350 degrees. I tried to keep my temperamental oven at around 300 for these, holding the door slightly ajar with a spoon. This way I can keep them in longer to assure that the insides are cooked without browning them on top, which happened with a batch that was drier / baked higher. Bake in fully preheated oven for 5 minutes, turn the pan, and bake for around 8 minutes more, or until the “feet” of the macaron are a bit sturdier than soft. Cool on sheets for two minutes, then remove to rack to cool completely. Fill with prepared lemon curd and refrigerate to harden. Serve at room temperature with tea. Preferably wearing a skirt. Or at least barefoot. 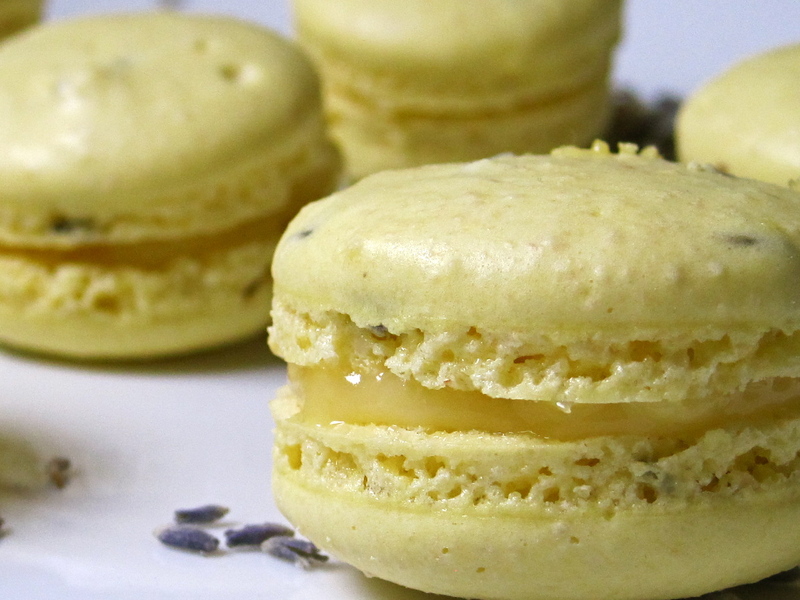 Lavender Tea with Lemon, Please: A cup of Macaron. Anyone who’s tried to make these little bits of delight in their kitchen has most likely failed at least once. And if you are one of those rare people without professional culinary training that perfected the art of the macaron on the first try, please come over and play with me. Macarons are notoriously difficult to make. Which means that they’re the perfect challenge for when I’m in the mood to make something complicated that claims all of my attention. Usually I’m in this mood when I’m chewing on something. Figuratively, I mean. I find nothing more calming then browsing recipes, coming up with a game plan, pouring some cheap red wine into an inherited crystal punch cup, and folding almond batter into whipped egg whites. And tonight I’m chewing. So I decide to go for broke with both bowls of egg whites I’ve had out “relaxing” since yesterday morning. I have two baking events coming up, and while I’ve let myself get down to the wire with my recipes, I’m very excited for the combination of a tea-themed event and an online auction to benefit Japan. But, oops, I don’t have parchment! Off to the grocer’s. Ends up, there is no parchment paper to be found in Washington Heights. Evidently tamales and chile recipes don’t call for it. So I grabbed a roll of waxed paper and hoped for the best. And, yes, there is a HUGE difference between the two. I’ve learned. But what can you do? My philosophy is “making a mess into mmmmmmm”, so I’ve gotta stick by my dusty ways and make do. And I made macarons! 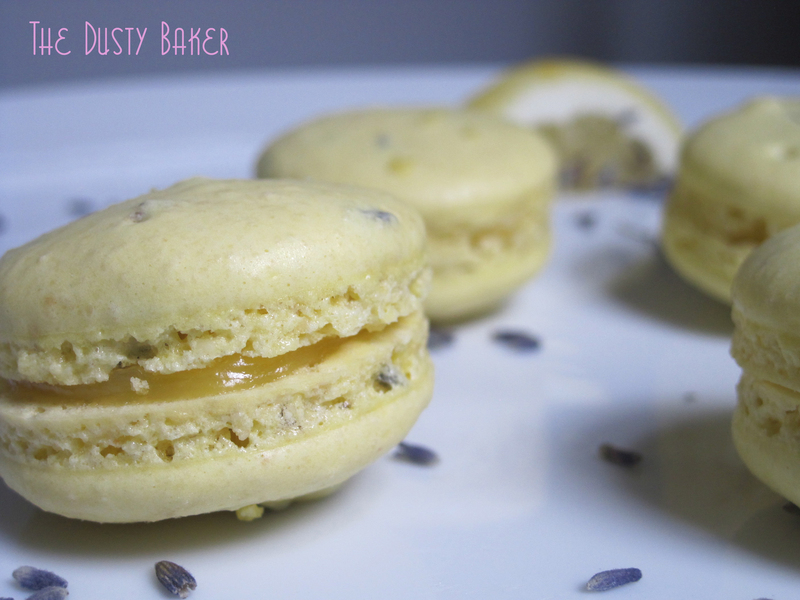 Tinted a delightful spring yellow, pumped with the scent and light flavor of lavender tea in the macaron shell and with a tart lemon curd filling. 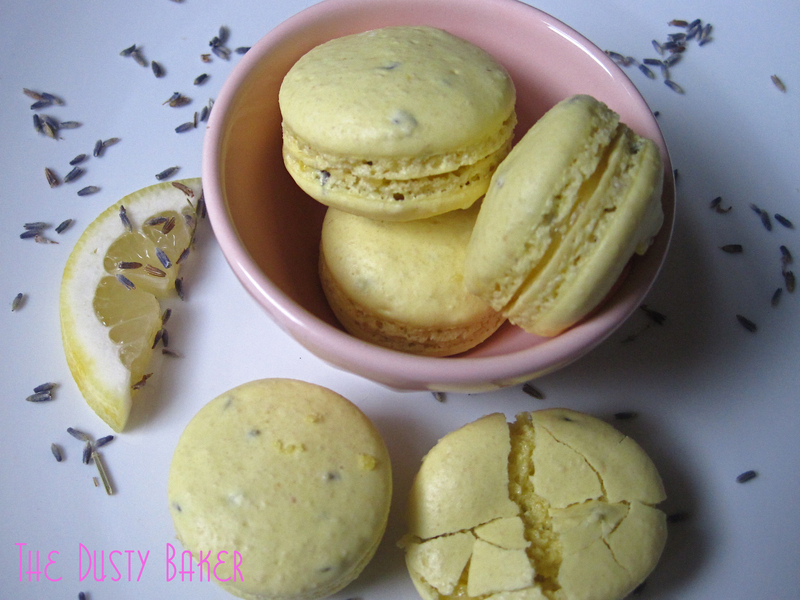 I also made a lemon macaron with fresh zest to be filled tomorrow with a lavender buttercream filling. Not quite as close to “there” as these, but getting there. What is working more and more with each test batch? The amount of whipping that produces the perfect “stiff peaks” that are neither too marshmallow-y nor overbeaten and borderline dry. Both processing and sifting the almond flour / confectioner’s sugar. Folding the almond flour in three batches, sifting each time. A properly heated oven: I discovered starting around 350 degrees then dropping the heat and holding the oven door open with a wooden spoon worked perfectly. Now I’m extra excited to take a macaron baking class with my lady friends and buying the right equipment to make this process easier. Recipes / details / better photos to come!